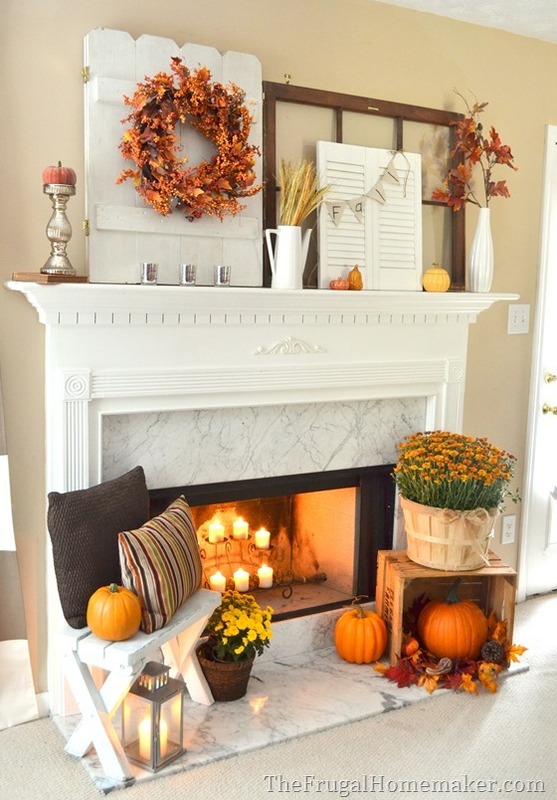 Let’s kick off this series by sharing my fall mantel. Decorating my mantel is one of my favorite things to do when I decorate my home for each season. I use non-seasonal items such as windows, candlesticks, lanterns and then add seasonal accents or items to pull it all together. I recently found this wood crate (which was on my “look for at yard sales list”) at Value Village for $2. I love the rustic nature of it and especially the stamp on the side that says Farmer’s Market. 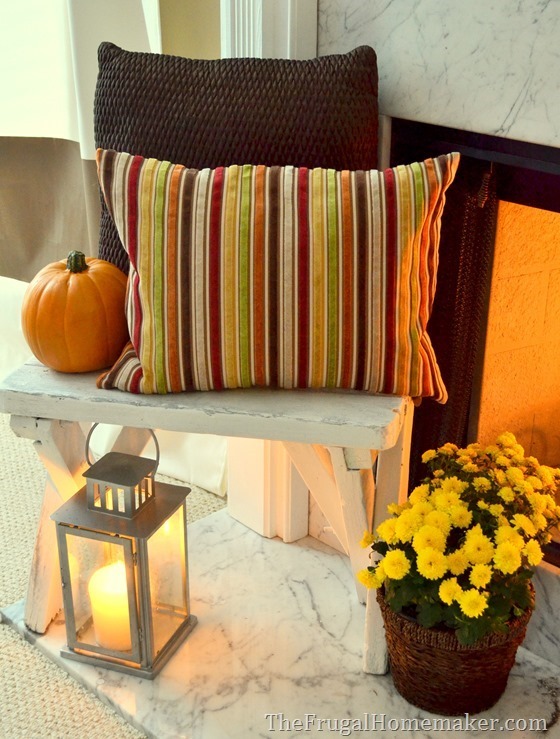 And of course my yard sale white stool is still there with some fall pillows. Some mums and a lantern grace the hearth. Just a note on my fall mums… I buy a few each year – usually the smaller ones, maybe one large one. When the season is over, I plant them outside in my flower gardens and most of them come back year after year! Some bloom in the summer and some bloom in the fall. So I get to enjoy them and make wise use of my purchases each year. I was actually inspired by Molly’s fall mantel to do more of layered/non-centered mantel display this year. I don’t have a cool sign like hers (she made hers out of half of an old door and then painted the words on it), so I used this white gate/barn door looking thing instead. I picked up that big white gate/screen thing at Value Village this summer. It actually spreads all the way out the opposite side has a floral scene painted on it. I am guessing it was a homemade fireplace screen. But I live it because it looks like a barn door or gate. 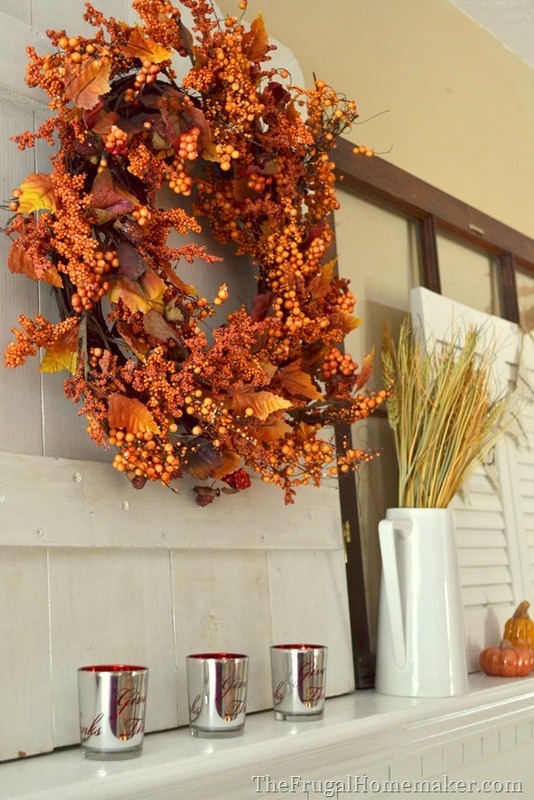 I hung a fall wreath on it – also picked up at a yard sale this past year. The other side has an old window with a shutter layered on top and my burlap fall banner I made a few years ago. 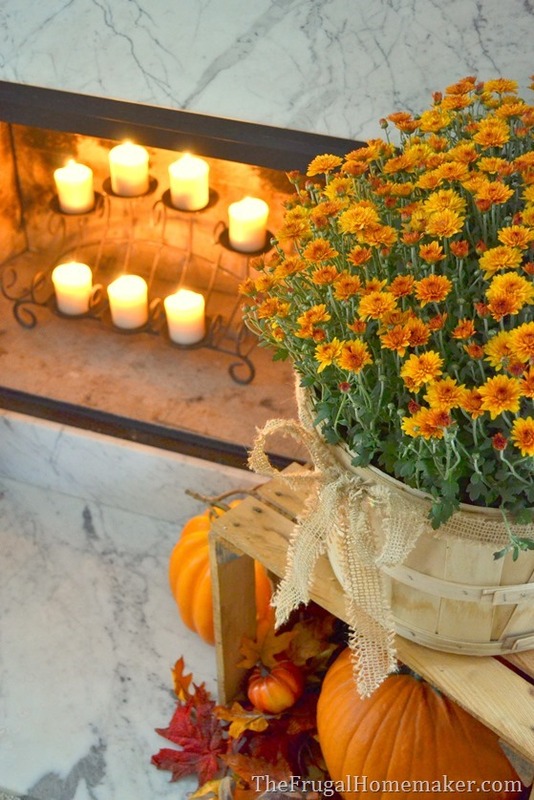 A few accessories – BHG mercury glass Give Thanks candle holders, a white vase filled with dried wheat, some ceramic pumpkins (can’t find small real ones for sale here yet), and a vase filled with a stem of fall leaves. Last year I went very neutral with my fall and Christmas decorating and this year I think I am going to go very colorful! Lots of oranges and reds for fall! You can see the other side of my living room and all the new pillows I got from Pier 1 in my fall living room post. So there is my fall mantel for 2013! I am really loving it. 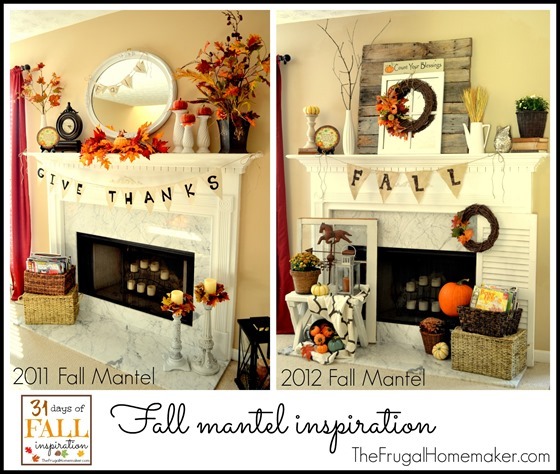 And for some more inspiration… here’s my past 2 years of fall mantels. You can get more details on the 2011 fall mantel here and the 2012 fall mantel here. 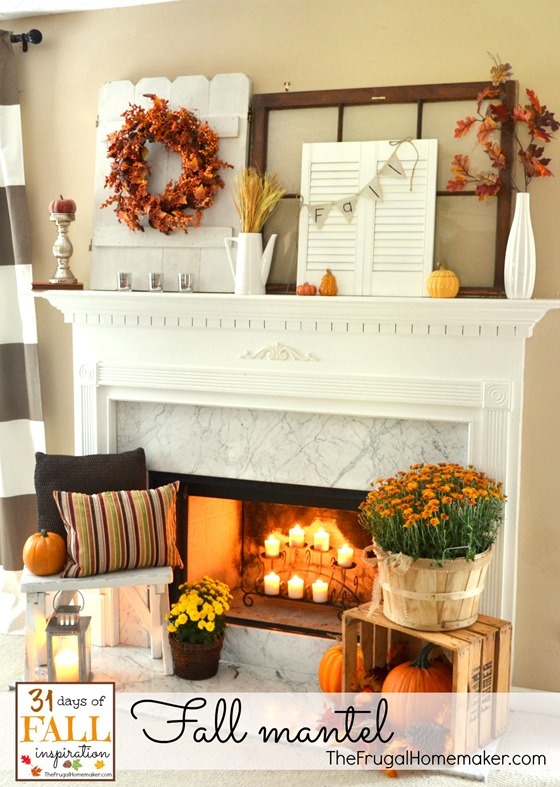 Do you like to decorate your mantel for fall? If you have pictures of your fall mantel be sure to share in the comments! I love how this year you used the whole spread of the mantle as the focal point, not just one piece in the middle . and the wood from the crate makes it so warm and cozy. gorgeous! I love everything fall, so I’m totally excited about your 31 days of fall!! Your mantle is beautiful. I love the garden gate thing, and who doesn’t love a basket of mums? You are so talented. Everything looks so pretty! Love the layering on your mantel. That’s such a fun look to me. OH I love the wood screen thingy! And I noticed on your past Fall mantel you had a barn wood backdrop on it too. I love it and want to make one for myself. 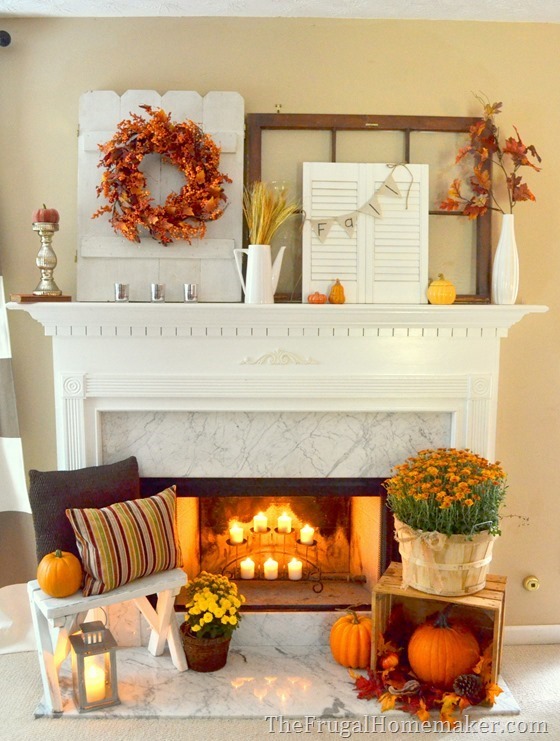 Your Fall mantel looks great! I love how you take your blank slate of a fireplace and liven it up with awesome color! 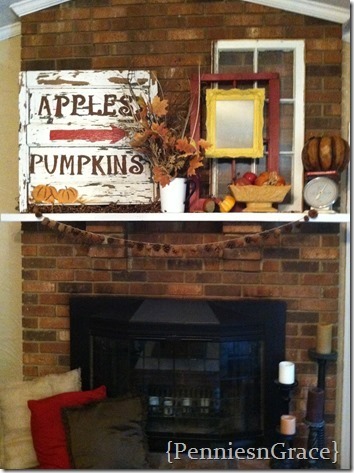 I used my grandmother’s paintings of red barns for inspiration of my fall mantel. I would love for you to hog over and check it out. I can’t wait to see your 31 days of fall! It looks as though Autumn is having a party in your living room! Love all the orange and red pops! It looks great, Christina. Your mamtel is beautiful – so full of color, texture and so rich! Thanks for the inspiration! Your mantel is gorgeous! 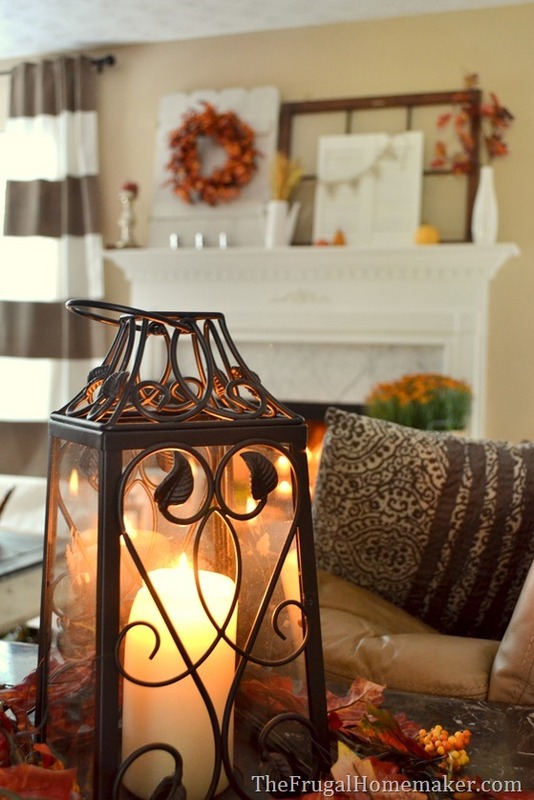 Your room just speaks fall. Jerralea recently posted..How Sweet the Sound! 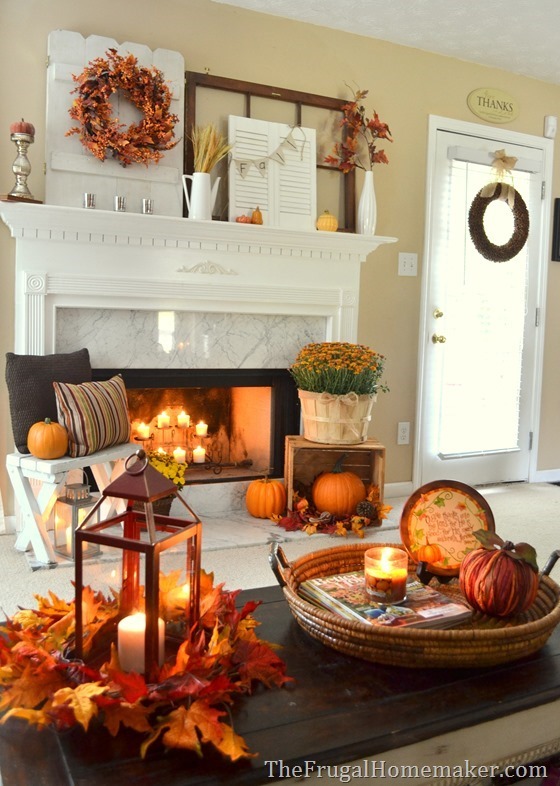 I just discovered your blog and your mantel and fireplace are just gorgeous dressed for fall. I am going to start following your blog and I would love for you to follow Cloches and Lavender back. New adventures are beginning. Such a beautiful job! I love the real mums in the baskets too. I’ve never tried having them in the house. Do they do well for quite a while? Do you then plant them outside? The only thing I would change (and this is my “eye” you may see it differently and not agree with me) is that I would use a larger, real pumpkin on the candlestick on the left. Like a pie pumpkin. I think it would balance better. However, that’s me, you might prefer it the way you have it. I enjoy your blog a lot! You are very clever. Oh my! It looks straight out of a Pottery Barn catalogue! BEAUTIFUL! Brandi – Nest of Bliss recently posted..How To Choose The Perfect Paint Colour. I need this! 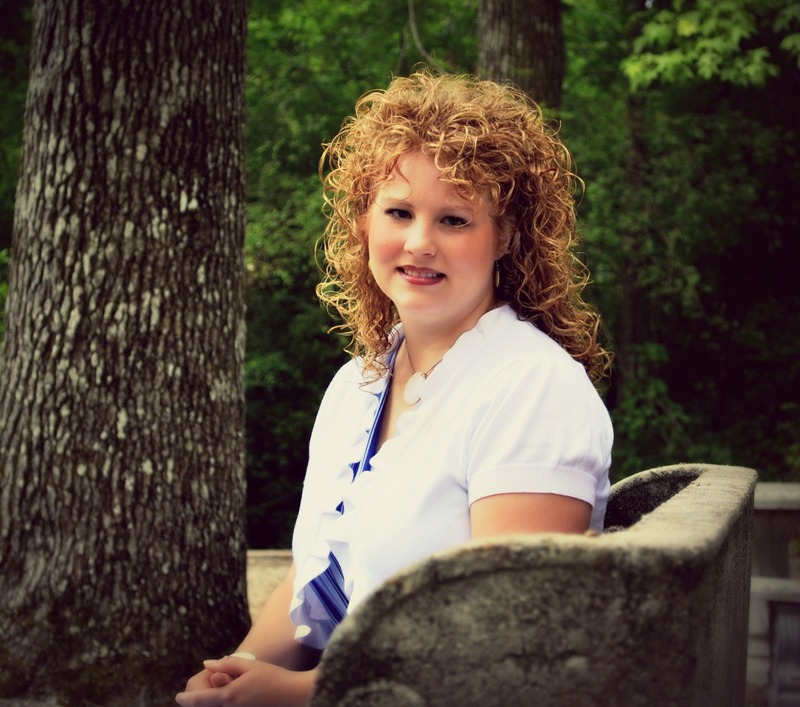 I am so glad to find your blog and follow along! The mantel is gorgeous, btw! 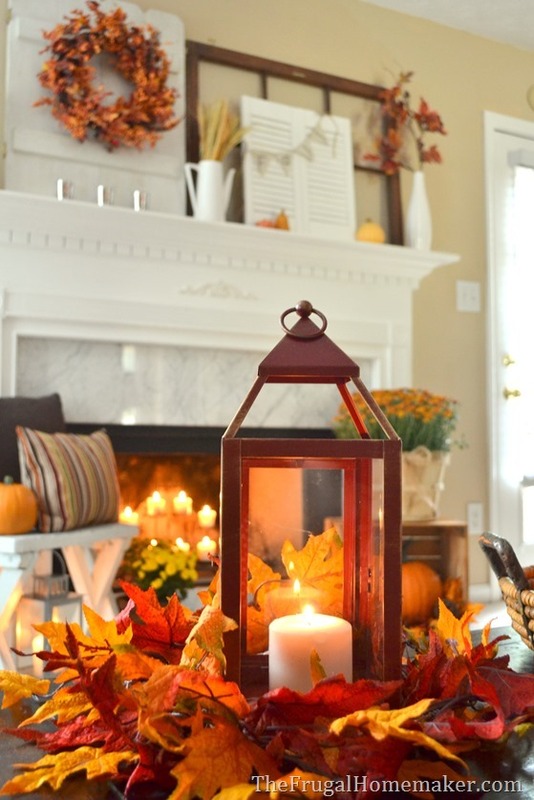 I’m going to steal your leaves & lantern creation when I host my first Fall Lunch with the inlaws next weekend. You have a precious home and a lovely way with it. Where did you find the curtains? 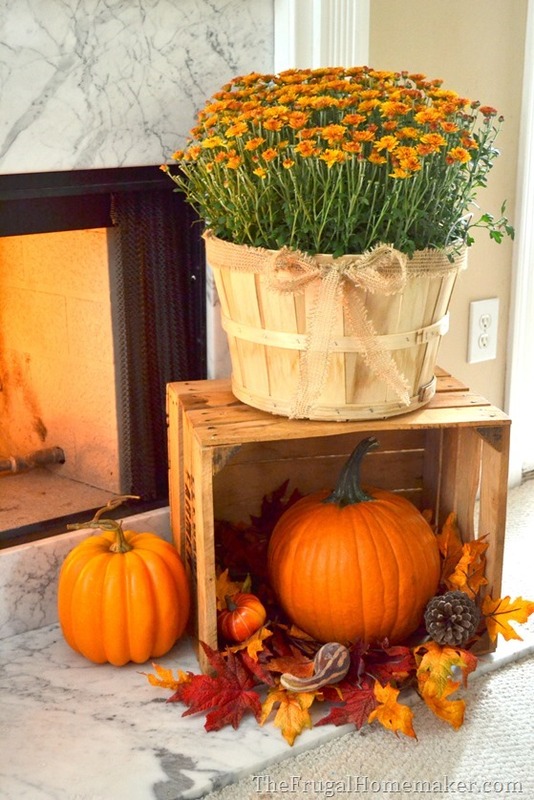 Love all of your fall decor, too! I really like the paint color of the walls in your 31 days of fall mantle. Do you happen to know the brand, color and the finish? Yes it is Classic Taupe – in flat. 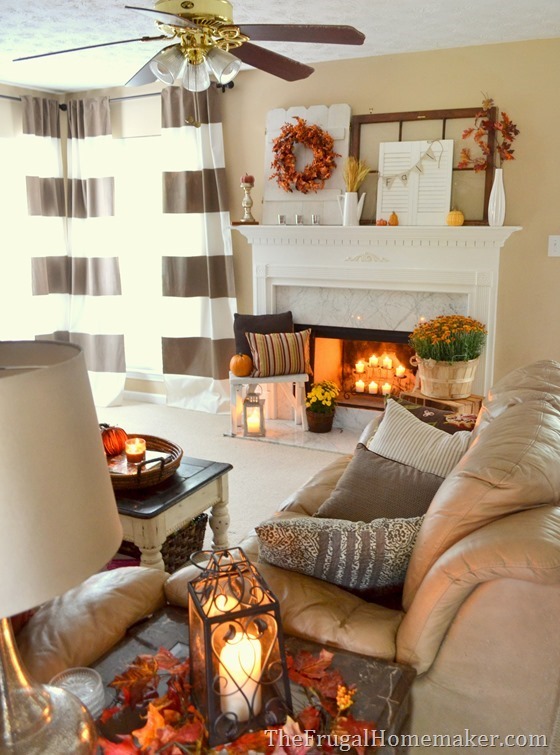 Love all of these ideas for fall!! I used to follow you a few years ago and then I got a Mac and lost all the people I followed. I found this post on Pinterest and thought I absolutely love this, pinned and found out it was you. 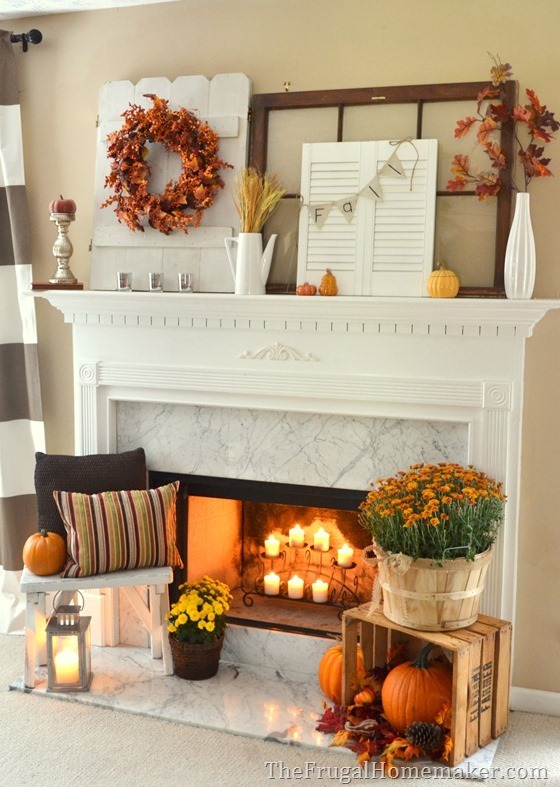 What is the wall color in your fall mantel photos? Absolutely love it! Love it..where did you get the candle holder in the fireplace? ?